What's better than catching big, beautiful, blue crabs? Nothing really, however, cooking them is pretty exciting. There are many ways to cook blue crabs. Some people boil blue crabs, some people steam blue crabs, and then some clean the crabs out then cook them a variety of ways. Large steamer pot - This can be either a large steamer pot that can be used on the stovetop, or a large outdoor steamer which is usually hooked up to a propane tank. Tongs - To pick up the crabs and place them in the pot. Beer - 1 or 2, 12 ounce bottle(s) or can(s) depending on how many crabs you are cooking. J.O. Brand #2 Seasoning - You can buy it here. It is a good idea to ice the crabs about a half hour or so before cooking them. Be sure to check the crabs to make sure they are all alive before icing them. You do not want to cook a dead crab. Check out the "Assessing your Catch" section for tips on how to check if a crab is dead or alive. Icing the crabs will put them in a sleep state so they don't attack each other and rip their claws off when going into the steamer. Now it's time to prepare your steamer. At the bottom of your steamer, under the rack, add 1 part beer and 1� to 2 parts white vinegar. 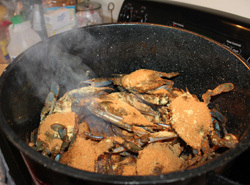 For 3 dozen crabs I would add 1� 12oz beers (be sure to drink the other half) and about 18-24oz of white vinegar. For 6 dozen crabs I would add 2 beers and about 36oz of white vinegar. Put the steamer on high heat and bring to a boil. When the beer and vinegar mixture begins to boil, you can start adding your crabs. 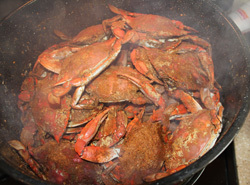 Before adding your crabs, turn down the heat to a medium to give you time to add all the crabs. 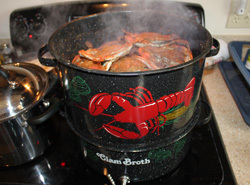 Be sure to have a rack in your steamer to separate the crabs from the liquid. Start adding your crabs to the pot one by one using a long set of crab tongs. It is ok at this point if the crabs are not moving or not showing any signs of life since they have been on ice. Put the crabs in the pot with the top of the shell facing up, and layer them, stopping once each layer is complete to add seasoning. After each layer, add a generous portion of J.O's to completely cover each crab, then sprinkle some old bay and dry mustard on each crab. Repeat this for each layer of crabs. When the pot is full, put the lid on tightly and turn the heat back to high. Set the timer for 25 minutes. They may need to cook longer depending on how long the crabs were on ice. When checking for doneness, the shell of the crab will appear a bright orange. If they are a deep red or greenish color, let them cook a little longer. Be sure to wash the tongs you used to handle the live crabs before handling the cooked crabs to avoid contamination. Serve immediately when done, just be careful as they will be hot. Line your table with some newspaper, get your crab mallets out, and enjoy! When the crabs finish cooking, take them off the heat and dump them directly on the newspaper lined table, or serve them on large baking trays. Do not cover the crabs in any way to try and keep them warm. 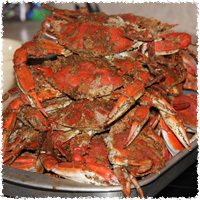 Keeping them covered in the pot, or covering the hot steamed crabs tightly with foil, or anything else, will continue to cook the meat inside the crabs causing them to become mushy and overcooked.